I recently returned to the place online where I asked the question, “What lies are women tempted to believe about who we are?” As I scrolled back through the answers, I saw all over again how many expressed, “I’m just a mess.” In other words, I can’t possibly be amazing. And yes, none of us are perfect. We “all have sinned and fall short of the glory of God” (Rom. 3:23). But that is only part of our story—and Jesus has already rewritten it. We reflect the image of God. We are beings with souls. We have hearts full of hopes and desires. God has placed invisible gifts within each of us. And when we give ourselves to Jesus, we are mysteriously created all over again. “If anyone is in Christ, the new creation has come: The old has gone, the new is here!” (2 Cor. 5:17). We are not a factory-assembled product. “We are God’s masterpiece” (Eph. 2:10). I once helped facilitate a creative retreat for a group of women. I shared encouragement, and other instructors guided the group in art journaling as a response. Here’s what I learned: those journals were messy, but they were not a mess. They were full of wild loveliness, vivid declarations, and passionate displays of hearts laid open. In many ways, we are God’s art journal. We are the expression of His love on history’s pages. Is it a neat, practical process? Absolutely not. Just think back over the biblical women we’ve learned about together the past few weeks. So many struggles. So much pain. But also so much strength. So much beauty. The women at the retreat often offered disclaimers. “It’s not really what I want it to be,” they’d say. “Hers is better than mine,” they’d protest. Some of that came from insecurity, but it also seemed to stem from a fear of being prideful. Don’t we do the same? Thankfully, David took care of that concern: “I praise you because you made me in an amazing and wonderful way” (Ps. 139:14). 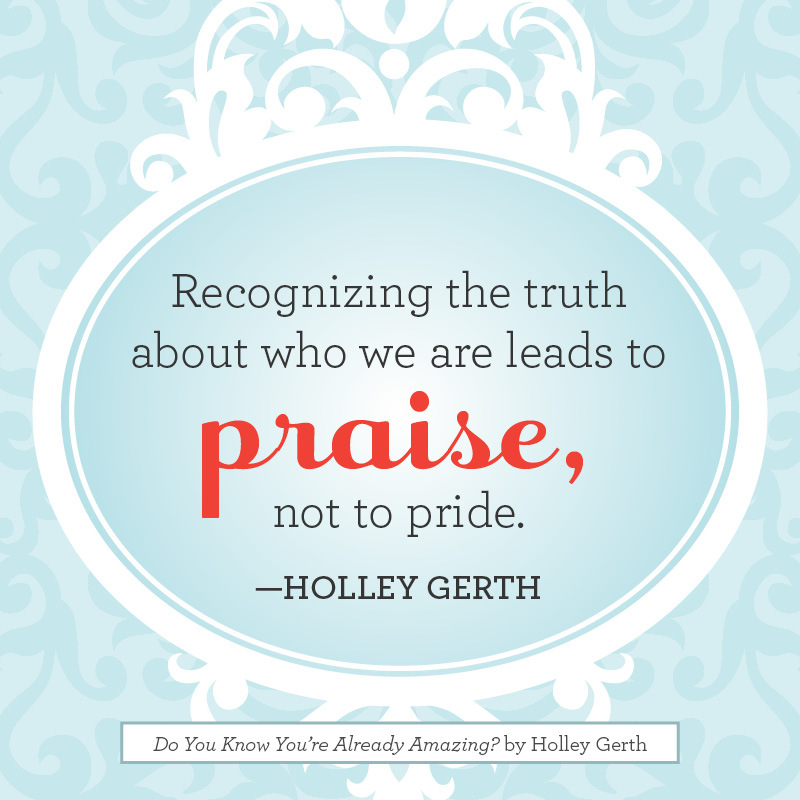 As I’ve said before, recognizing what’s true about who we are leads to praise, not to pride. I chose the word amazing for my new devotional because the definition is “causing great wonder.” It’s the response our souls have to the creations of an astonishing artist. As long as we are in this world, we will encounter lies. They will try to erase our faith and cover our identities. But we have this promise: God who “began a good work within you will continue his work until it is finished on the day when Christ Jesus returns” (Phil. 1:6 NLT). My prayer is that seeing the truth about who we are and who God is fills us with new wonder and worship–today and for all of eternity. Thank you, Holley, for this post today. I love this quote: In many ways, we are God’s art journal. As an artist, I value my creations dearly. Knowing God sees me as his masterpiece is a wonderful healing balm to my old patterns of negative self-talk. Thank you for this reminder! 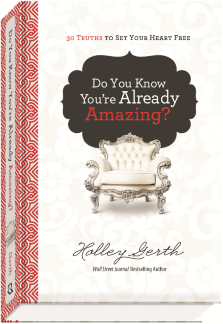 Holley, I wonder…were we “less of a mess” before social media took over our lives? The competition is fierce. Pinterest-perfect. Twitter-worthy tidbits. Facebook-fabulous. Are these a detriment? I love SM but I work very hard at keeping it in perspective and balancing it with my life. When I was raising kids my inspiration, my go-to relaxation habit was sitting down with a cuppa and the latest issue of Better Homes & Gardens. Now, perfection is in our face all day long. Not sure we’ve come very far…. Susan, I’ve had the same wonderings myself lately . . . I guess every generation has its challenges, but we certainly need to trust God for daily (hourly! minute by minute!) grace to return to thanksgiving and to reject odious comparisons! I love drinking in the encouragement I know will be here when I come to visit, Holley. I know these truths in my heart but it does good if I hear it from another believer, as if to nod in agreement and affirm it. I have dealt with the “fear of being prideful” and it is utterly annoying, trying to dart around words and dodge feelings that might make me appear to be prideful. It is hard work. I am participating in an Emotional Freedom Growth Group and I am learning how to better let my feelings take their turn instead of holding them back. Then I can go back and replace any lies with God’s truth. So this was good for me to read, as it replaced the lie of, “I will never get myself together enough to actually do what I need to..” Because Jesus has already done it. If I write from that place, my heart is lifted up instead of bogged down. Thank you friend! Here’s hoping we quit believing we are a mess and instead believe we are amazing women and work in process. When I was barely 30 my friend 60 year old friend called and she said, “I thought by the time I got this old I would have it all together and not have so much mess in my life.” I didn’t know what to say, so I prayed. These are the words that came to me. “If you had your life all together what would there be to live for, to work on, to improve? We are all going to be un-perfect and have messy lives and short comings until the day we die. And only then after we die and are changed will we be perfect, like we now want to be.” And as I get older, I try to remind myself of these same words. Theresa, I’m 47 and that’s exactly how I’ve felt and I’ve even said that very same thing! Ugh! It’s hard to wrap my mind around being messy the whole of my life. Thanks for the encouragement, and for hosting the link up! This was a beautiful reminder. As always, Holley, your posts fill me with hope. They always point me to who I am in Christ, and I need those reminders! Thank you. Blessings and hugs to you! I love this idea of being messy but not a mess. The wording is only slightly different but it means something totally different to me. Thank you for this beautiful reminder of who we are in Christ. What a blessing!! Words do matter. Hearts are real. Women are amazing! We are strong. It is building a better relationship, encouraging each other it’s a blessing! I love Phil. 1.6! It’s so full of encouragement. And it’s so freeing to realize it’s God who created us, recreated us in Christ, and is finishing what He started. So we have nothing on which to boast in ourselves, but we can boast in Him and His faithfulness. Thanks for these great reminders and thanks for hosting. Each of you are a masterpiece! Really, truly. In a perfect world we would see ourselves as Jesus does! My bible study group went over the “Who we are in Christ” today. We need to always remember who we are. Thank you for sharing this uplifting post today! Blessings to you! as always your post is so encouraging. Thank you so much, also for hosting. Why is this so hard to accept? I think Satan tries his best to convince us we aren’t and most things in the world would support that.